Shelly is a decent tennis player, but she won't take a tennis lesson. We are sitting courtside watching Head Pro John conduct a group lesson. She starts our conversation. "I don't take tennis lessons. I'm not a lesson taker. I don't get anything out of them. I'm not going to change my game. I play the way I do, and I don't see any reason to change. Let me ask you: why does anyone take a tennis lesson? I don't know, but I can tell you why I don't. I don't like standing around listening to the same old "turn, racquet back and down, move to the ball" and all that stuff. Shelly, tennis lessons aren't just to teach how to execute a particular stroke or to change the way you do it. We teach a Standard Technique in our lessons, not that it is the only way to do it, but it represents a proven approach against which to measure your game. It is an efficient way to use your feet, body and racquet. Also when things go awry, as they sometimes do, it is a structure to help re-tune your technique. Like I said, I'm not going to change my game. Shelly, we don't want to change your game, we want to improve it. A good instructor will suggest improvements to your game toward that more efficient technique. 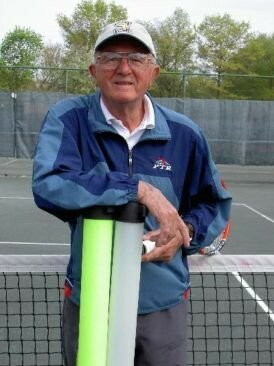 One of the great all time tennis teachers, says in his book Ed Faulkner's Tennis: How to Play It, How to Teach It, "Every swing--and I've seen thousands and thousands of them--is different." So you see you don't have to change, really. Shelly, in any tennis class there are students of different ability levels. For the more advanced players an instructor may notice a slight adjustment in technique to improve accuracy or consistency. There's always something a good instructor can offer. Like I said, I play the way I do, and I don't see reason to change. That's okay. So you won't change, but will you improve? Shelly, tennis techniques are constantly evolving. For experienced players like yourself, we try to acquaint you with something new. Lessons aren't aimed at changing your game. You might find something useful and adapt that to your game, not your game to it. Well maybe so, but you have to stand around a long time to get to it. You shouldn't. The challenge of a good instructor is to keep everyone moving as much as possible. But you can also learn a lot by watching. Actually you should be shadowing every stroke, every position. Well there's still a lot of standing around. There really shouldn't be. Let's talk about a good tennis lesson. It starts with a warm-up period at the net, followed by basic instruction in a technique or a strategy. Then a drill to reinforce the item just taught. I don't like running around in all those drills. We just run around, get sweating and you think you taught us something. Hmm. Shelly, drills are designed to provide repetitions, the idea being to develop "muscle memory." For instance, how many backhand overheads do you see in a match? When you need it, you want it to be there. An old Penn tennis ball ad points out, "There's no such thing as a small point." For that matter, how many forehand overheads or drop shots do you play in a match? These are techniques, among others, that could stand some exercising or even adjusting. Yes, but it's different when you play. True, drills present predictable situations, so a good lesson also includes competitive play where the situations are unpredictable. Well, it takes a long time to get to them. Well actually as a class progresses, more time is spent in competitive games and playing sets. These give you opportunities to use the techniques presented. The emphasis then is on the tactical aspects of playing the game, the mental part of tennis. The earlier in the course the better. It could be a stop-go situation where the instructor interrupts play to point out a missed opportunity, then immediately resumes the activity. Yes, but I'm still me and I play the way I do. Shelly, may I ask you a rather blunt question? (She nods.) Are you afraid to take a tennis lesson? No. I am not! Why do you ask? Sorry. Some folks are, so I had to ask. Shelly, you can learn a lot about yourself in the mental phase of tennis, the tactics. How to use your technique to best advantage and still play the way you do. When to use it. This is why touring pros have coaches. You can always adapt something good to your game from an advanced lesson from a good instructor. Yes, but where do you find one? You can ask questions. Ask around. Good instructors have a reputation for quality. Ask if your instructor is certified by one of the certifying organizations, PTR or USPTA? Are they continuing their tennis education by attending symposiums and conferences held by PTR and USPTA? USTA Sections also host instructor's conferences locally. These are indicators of a good tennis instructor. As a comparison, a flight instructor is required to attend a flight instructor's refresher course at least every two years to retain certification. Otherwise they must re-fly the entire certification process in an airplane to regain certification. Even though tennis instructors are not required to do anything like that, these are still valid questions. Ask them. Again, you can learn a lot by watching. Watch a potential instructor conduct a lesson and decide whether you would be satisfied in that sort of class. Epilogue: At the end I ask Shelly if our conversation helped her. She smiles, nods and walks out toward the backboard. Was it useful, this conversation with Shelly?